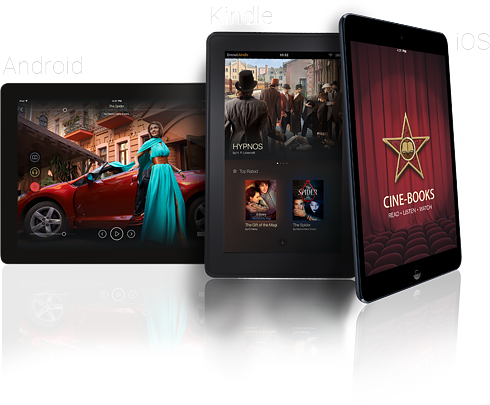 CINE-BOOKS is a multiplatform channel of entertainment available on mobile devices - iOS, Android, Amazon and on the web! Watch on your tablet. You can experience cine-books on your tablets just wherever you go (iPad, Android tablet or Amazon Kindle Fire). Watch on a big screen. You can share the cine-books from your tablet to a big screen via AirPlay or Chromecast. Use any computer. Watch right on cine-books.com on any computer (PC/Mac). Books purchased on cine-books.com are available for use on all current and upcoming platforms. Books bought as in-app purchases are available for 1 particular platform only.